Trees are a hallmark of vibrant neighborhoods. 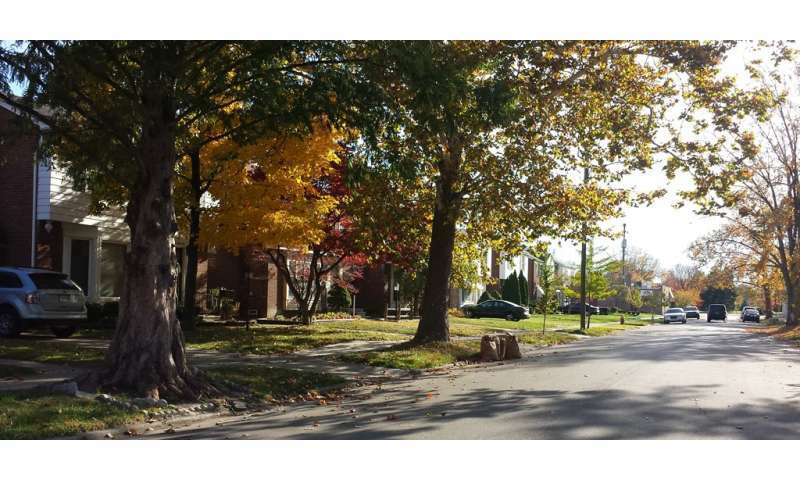 So why did nearly one-quarter of eligible residents in Detroit, Michigan, turn down free street trees? That's the mystery University of Vermont researcher Christine Carmichael solves in one of the first studies to explore opposition to city tree planting programs. As cities from New York to L.A. embark on major tree planting initiatives, the research helps to explain why more than 1,800 of 7,425 eligible Detroit residents—roughly 25% - submitted "no-tree requests" between 2011 and 2014 alone. The study was published January 7 by Society and Natural Resources journal. "This research shows how local government actions can cause residents to reject environmental efforts—in this case, street trees—that would otherwise be in people's interests," says Carmichael, a postdoctoral researcher at UVM's Gund Institute for Environment and Rubenstein School of Environment and Natural Resources. Carmichael found that the opposition in Detroit resulted primarily from negative past experiences with street trees, particularly in low-income neighborhoods grappling with blight from vacant properties. In 2014 alone, the city had an estimated 20,000 dead or hazardous trees, following the contraction of Detroit's once-massive tree maintenance program from budget cuts and population decline. For many long-term residents, wariness of the new trees was driven by past experiences of caring for vacant properties in their neighborhood. They believed responsibility for maintaining the trees would eventually fall to them. "Even though it's city property, we're gonna end up having to care for it and raking leaves and God knows whatever else we might have to do," said one woman interviewed for the study. Carmichael also found that skepticism of the program was tied to wider distrust of the city government and outside groups in parts of Detroit. As a result, residents wanted greater decision-making power in selecting which trees to plant in particular locations, adds Carmichael who completed the three-year study for her Ph.D. with co-author Maureen McDonough of Michigan State University. To avoid past mistakes in the city's tree planting and maintenance approach, staff at The Greening of Detroit, a non-profit contracted by the city to plant trees, selected tree species that could survive in urban environments and guaranteed maintenance of trees for three years after planting. However, the group relied primarily on educating residents about the benefits of trees and their program, which failed to address people's concerns. "By not giving residents a say in the tree planting program, they were re-creating the same conflicts that had been happening in the city for a long time," says Carmichael. One man interviewed for the study said, "I've left several messages. My tree was planted last August. My wife loved it. I was told that they would come back out and either water it or fertilize it. Haven't seen anyone. So, I've been doing the best that I can. Where do I go from here?" Monica Tabares of The Greening of Detroit says that increased spending by the City of Detroit's forestry department, as well as a change in the organization's leadership, has led the group to focus more on community engagement. Since Carmichael presented her findings to The Greening of Detroit, the organization has instituted community engagement training for the youth they hire to water street trees and interact with residents. "As a result of our refined focus, [our program] has brought thousands of residents together to not only plant trees, but gain a greater understanding of the benefits of trees in their communities," says Tabares. Carmichael's study is gaining attention from city planners across North America hoping to learn Detroit's lessons. Local governments and non-profits in Austin, Denver, Indianapolis, Sacramento, Toronto and Vermont have reached out for help implementing her research. With limited resources and watchful donors, some non-profits often focus on narrow outcomes—such as the number of trees planted per year—without also prioritizing deeper community engagement, which might slow the immediate work of planting trees, but create more a sustainable outcome. "We need to broaden the measurable outcomes that we can gauge success by," says Carmichael. "Healthy urban forests cannot be measured just by the number of trees planted. We also have to capture who is involved, and how that involvement affects the well-being of people and trees in the long-term." Shade trees fight global warming in Calif. Rejecting opportunities to increase vegetation is an indicator of ignorance. unless you live in the center of the jungle. Detroit metropolitan is known for poverty, despair, chaos, violence, crime, conditions that are sustained by ignorance. Racial segregation is a factor too, as Detroit is mainly a ghetto. Hell, at my age? I sure wouldn't want to have to take care of no damn trees. I would prefer fruiting bushes but unless those are thickly entwined # with big sharp thorns? Those would be a serious threat to property security. Given a choice? I would want low-growth decorative plantings & micro-garden strips. Many years ago the town that I was living in had a tree planting program. I allowed them to put an oak in the parkway, between the sidewalk and the street. Fifteen years later the tree encroached upon my sewer line and plugged it up. The replacement of the sewer line from the street to my house ended up costing me several thousand dollars; it was filled up with tree roots. T, you were "feeding" the tree roots!